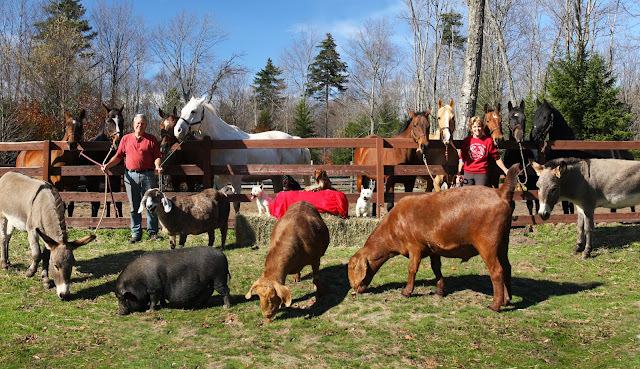 While looking ahead into the new year, we count our blessings for the wonderful year it has been at Moose River Farm. To all with whom we share our farm, we wish you a joyous Christmas and much happiness in the coming year. Thanks so much for your loyalty and support. I have been on the go every weekend lately, promoting Finding My Way to Moose River Farm during the holiday season. Not only do the commitments lengthen an already long week, but they also confiscates valuable time away from my animals. Despite this I am thoroughly enjoying the process of spreading the word about my book. The many people I have met or reconnected with along the way have added so much to the experience. Occasionally, I have been able to bring smaller members of my menagerie along to meet and greet potential readers. One of my favorite things is to share the animals with others, especially children. Youngsters reach out to stroke Rosemary, the iguana or Bing the donkey with an air of confidence not yet eroded by a preconceived notion of fright. Adults usually come around after being reassured that they are safe in the company of the lizard lying on the table. A fence around the donkey and goat affords a more tangible degree of protection from anything they might do deemed unpredictable. My goal for everybody visiting with the animals at these various book signing venues is quite simple. I want them to interact with my pets at the animal's level. The iguana will not come when you call her, but she will stretch her neck and press against a finger that is scratching her head. A goat will approach someone standing quietly, moving minimally. And a donkey loves close contact hugs from those who greet him at eye level. When time is taken to accommodate the animals, many may experience a glimmer of my relationship with Rosemary, Bing and Liam. All this time spent engaging with animal lovers has kept me away from the horses. My contact time with them is limited to routine care in the morning and at night; much like a school day. On the rare weekend that I get to spend entirely at home, I bask in their presence and make a point to linger in the barn. I miss them. Around my waist is also one of my favorite things; a leather belt with seven or eight nameplates attached. Each one is engraved with the name of one horse, past or present, including Bing and Frankie, the donkeys. My thirty-six year career with horses has, in fact filled two belts with nameplates. Every horse from Promise, (my first), to Gatsby, (my newest), is riveted in place. Fastened to the strap and buckled around my waist I feel their embrace while I am away from home. Rosemary joins the fun at the face painting table and even gets her nails done! Kendall can't get enough of Bing as Liam watches from the trailer. Rosemary is reunited with her 'grandmother', Anne Beckingham, at a book signing. Our iguana is named after Anne's mother, Rosemary! My neighbor from the days that we lived in Inlet showed up at a book signing with her Westie, Roger and Welsh terrier, Chester. Rosemary snuggles against Marion, the owner of the Holland Patent Farmer's Coop! When I can't be with them physically, I derive great comfort from their embrace around my waist. My favorite pieces of silver combine my love of horses with riding and an appreciation of how horses are put together on the inside.